Monday October 5th 1891 It was a beautiful day. I felt better and we had a large washing done by ten oclock. We ironed some in the afternoon. I wrote to Hattie and Lizzie Duncan. Will took me over about four oclock to mail the letters and get some things. I worked on a tidy in the eve. Tuesday October 6th 1891 It was raining when we woke in the morning and still raining when we went to sleep at night. I was busy with the house work all forenoon. I had Agnes blocking stoves up stairs. I sewed in the afternoon and finished the ridy for up stairs in the evening. Wednesday Octobver 7th 1891 It had stopped raining this morning. I was changing the feathers in some pillows today and papered wood boxes for up stairs and got then in place. I had begun another tody and worked on that in the evening after Mother and I had got a turkey dressed. 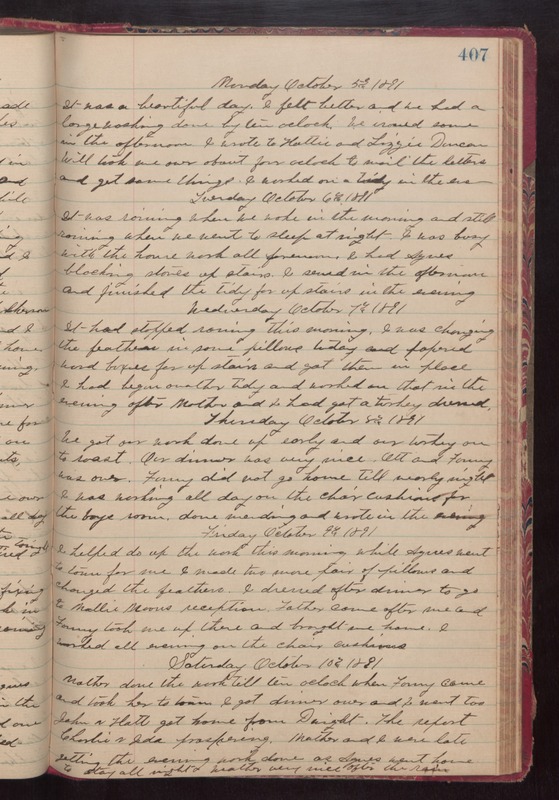 Thursday October 8th 1891 We got out work done up early and our turkey on to roast. Our dinner was very nice. Ott and Fanny was over. Fanny did not go home till nearly night. I was working all day on the chair cushions for the boys roon. done menidng and wrote in the evening. Friday October 9th 1891 I helped do up the work this morning while Agnes went to town for me I made two more pair of pillows and changed the feathers. I dressed after dinner to go to Mollie Moons reception. Father came after me and Fanny took me up there and brought me home. I worked all evening on the chair cushions. Saturday October 10th 1891 Mother done the work till ten oclock when Fanny came and took her to town. I got dinner over and I went too. John & Hattis got home from Dwight. The report Charlie & Ida prospering. Mother and I were late getting the evening work done as Agnes went home to stay all night. weather very nice after the rain.